Of Wind and Waves: The Life of Woody Brown, an award-winning hour-long documentary on a 94-year-old legend in the worlds of surfing, sailing and soaring, will receive its Kauai premiere at the opening night of the Kauai Health Guide Film Festival in the Grand Ballroom at the Grand Hyatt Kauai Resort in Poipu at 7:30 p.m. on Tuesday, August 8th as the opening night film of the Kauai Health Guide Film Festival. Maui resident, Woody Brown, will attend and answer questions along with filmmaker, David L. Brown (Surfing for Life). Woody has not only lived a life full of remarkable adventure and accomplishment – including inventing the modern catamaran, setting world gliding records, and surfing Hawai’i’s 25-foot surf in the early 1940s – but he has also done so with a kind of selflessness and generosity that have made him a role model for three generations of Hawaiians. Woody is like a modern Thoreau on a surfboard, living in harmony with the world around him, alive to the possibilities of each new day, and following his own singular vision of how to be in the world. The documentary captures his unique blend of enthusiasm, wisdom, humor and spirituality that have made him a truly inspirational figure for everyone who has met him. Born to great wealth in New York City, Woody ran away from the life of privilege to become a protégé of Lindbergh at age 16. The film portrays his journey to become a world record glider pilot, surfing pioneer and inventor. It also depicts the tragic death of Woody’s first wife in childbirth which led to the painful decision to let relatives adopt his two children. Of Wind and Waves explores Woody’s life in his own words and from the perspectives of his family and friends who have shared his journey. Family members adding their perspective include Woody’s daughters, Mary Sue and Jennifer, his sons, William and Jeffrey, and big wave surfing friends Wally Froiseth, Joe Quigg, Peter Cole and Fred Van Dyke. Surfing superstars, Laird Hamilton and David Kalama, are shown bonding with Woody and comparing Maui’s big waves from the ‘40s with the present huge surf at “Jaws.” The film also features a remarkably rich archive of film and photography from every stage of Woody’s long life to complement coverage of his contemporary life as an amazingly lively elder whose days are filled with service, friendship, humor, compassion, spirituality, and, up to his 90th birthday, frequent surfing. 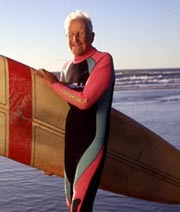 Among the high points of the film are Woody piloting a glider and skippering a catamaran at age 92, his volunteering at Hale Makua Adult Day Health Center on Maui, his tales of early big wave surfing, his story about his first experience sailing on a double-hulled canoe and then deciding to build the first modern one, and his poignant 2002 reunion with his 67-year-old son, Jeffrey and 75 year-old step-daughter, Jenny, whom he left in the care of relatives in 1939 to embark for the South Pacific. There are also very humorous recollections about Woody and “Ma” Brown from Woody’s daughter, Mary Sue, and granddaughter, Nicole Bastian. Of Wind and Waves provides a valuable cross-cultural portrait of the land, people and culture of Hawai’i over the six and a half decade span of Woody’s life there. While the explosive economic growth of the islands has unquestionably undermined and obscured many Hawaiian traditions, Woody Brown’s story shows that the spirit of aloha remains very much alive. Of Wind and Waves won the “Inspiration Award” at Mountainfilm in Telluride in May of 2006. The 35-minute version won the “Audience Award for Best Short” at the 2004 Maui Film Festival. "Of Wind and Waves: The Life of Woody Brown," with appearances by Woody Brown and filmmaker David Brown. Kauai: 7:30 p.m. Aug. 8, Grand Hyatt Kauai Resort, Poipu; $10 at door ASL intreperetation for deaf available. • Free Zone: Democracy Meets the Nuclear Threat, a 58-minute documentary on the international nuclear free zone movement which received 13 awards and was broadcast on public television and in several countries. Videography by Steven Baigel, David L. Brown, Vicente Franco and Judy Irving.